I won’t lie to you, when I bought this album back in 1998, I was bitterly disappointed by it. Generation Terrorists, of course, had been a breath of fresh air – an exciting, gnarly rocker; Gold Against The Soul proved that they were equally capable of cornering the pop market, while The Holy Bible was a staggering insight into the darkness of Richey Edwards’ mind. Even Everything Must Go, against all odds, was remarkable in its positivity, in the wake of Richey’s well-publicised disappearance – a commercial gem in the face of adversity, if you will. …perhaps I’ve previously been a little TOO dismissive of the album as a whole. Clearly, the band themselves were of a similar opinion, as the Charlatans like ‘Prologue To History‘, which was initially a mere B-side, now breaks up the rather dour tone of the half-dozen songs which precede it rather nicely. I’m glad it’s there. Somehow it even seems to render the record more coherent. The only downside is that it means ‘Nobody Loved You‘ is axed, which is a shame because, for my money, it was one of side two’s standout moments. 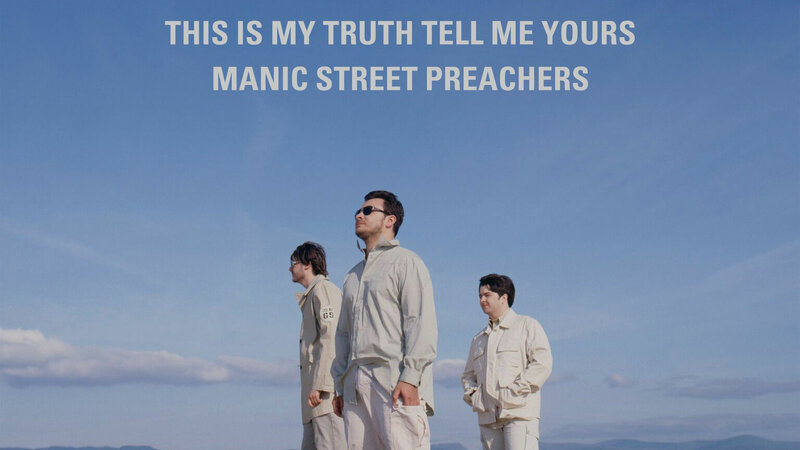 It’s interesting to note, however, Nicky Wire’s own observations on this record, when speaking to the NME recently: “I’ve just been listening to ‘This Is My Truth’ a lot. It’s such a deep and heavy album for a record that was so big. It just makes you realise that you can push the limits and have success.” So the stark feeling was fully intentional then. But it was never the bleakness I had a problem with – it was the fact that many of the songs were at least two minutes too long, and guilty of some pedestrian plodding. Interestingly though, listening to the demos, some of them probably shouldn’t have ended up that way. ‘I’m Not Working‘, for one, a bit of a snoozefest on the finished article, is a work of eerie, unsettling genius in its bare bones demo form, while on the other hand, the embryonic version of ‘The Everlasting‘ sounds like one of many of my own unsuccessful bands at the rehearsal studio until someone came up with the masterstroke of making Sean Moore’s drums bear little consequence to the song. They didn’t need to be as upfront as usual, here, and the focus on all other aspects of its composition lifted it to ‘classic single’ status. On the third disc, remixes of ‘If You Tolerate This…‘, and the long player’s other singles, act solely as curios for discerning collectors, while of more interest is the inclusion of all their B-sides. Best of these is ‘Black Holes For The Young‘, featuring a young, pre-megastardom Sophie Ellis-Bextor, which sounds quite epic in comparison to several of the album’s cuts and probably would have improved it threefold if used as its finale. In short, I guess it’s a testament to Manic Street Preachers and their indelible mark, on not just Welsh music but the scene as a whole, that I could have been so disappointed when they released an album I thought was just ‘good’ rather than great. With hindsight, it’s better than I thought it was at the time, but it’s never likely to be one of my absolute favourites. The singles are so good though, that it is still an essential listen. Personally. I think that there were two more magnificent tracks that could’ve been singles, ‘You’re Tender And You’re Tired’ and the magnificent ‘Black Dog On My Shoulder’, which has always been my favourite song on the album. Ellis-Bextor sings on Black Holes For The Young, not Valley Boy, in case you want to quickly amend it. My mistake, thanks Phil. Was doing several things at once while reviewing it. But yes, you’re right. Both great tracks though. I thought ‘Tender’ was a bit Manics-by-numbers myself. ‘Black Dog’ is definitely one of the better tunes though, admittedly. Interesting, which of their other songs did Tender mirror… ?I mean afterwards they did plenty of Manics by numbers but I never considered Tender to be one.